Here it is, the “famous” Different Songs. 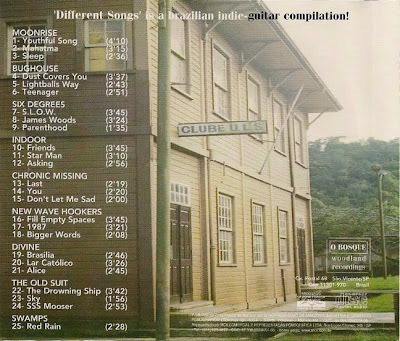 This is the compilation I mentioned in the presentation text of this blog, my first (and for the time being, only) effort producing a CD compilation with Brazilian indie bands, back in 1998. 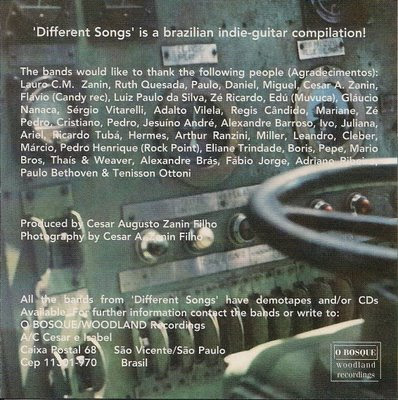 The idea was pretty simple, since no one who played in an indie band in Brazil those days had any money to release an independent album, I decided to invite some eight bands whose sound was good to me to participate in a sort of cooperative for a compilation project. So the bands handed over the recordings and the money equivalent to 1/16 of the total costs each and I paid for the other 1/2 and actually produced the album from top to toe (contacting/selecting suppliers, mastering, artwork, promotion). 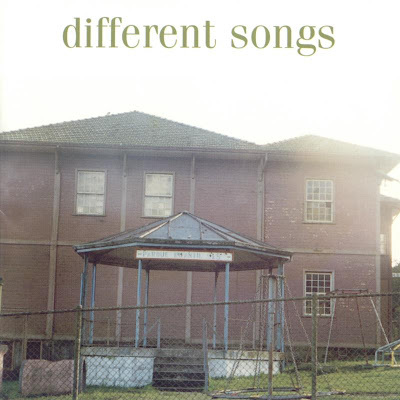 The release of Different Songs was surprisingly successful, if we think about the Brazilian indie scene of the 90s. 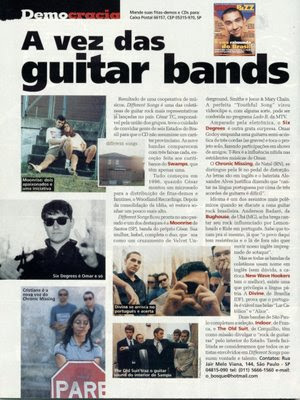 Good reviews, interviews and articles in many fanzines, newspapers and magazines from more than ten Brazilian states, some airplay on independent radio shows across the country, at least one video clip on Brazilian MTV (Moonrise’s Youthful Song), shows in at least 4 capitals (Sao Paulo, Curitiba, Rio de Janeiro and Brasilia) and many other cities.